Since the original release of the Sony RX100 back in 2012, the company has been pushing updates to the camera and releasing one new iteration every year. Which means that as of today, we have had a total of 6 such releases: RX100, RX100 II, RX100 III, RX100 IV, RX100 V and RX100 VI. Sporting a 1″ sensor and superb optics from Zeiss, these point and shoot cameras have been widely popular among photographers. And thanks to their compact size and low weight, the RX100 series cameras have been highly regarded as very capable, and yet pocket-able cameras that are perfect for such needs as travel photography. Unfortunately, due to the number of the RX100 series cameras, their differences in pricing and features, it has become increasingly difficult for potential buyers to understand the main differences between these cameras. In this article, I will be comparing the key features and specifications of the RX100-series cameras, which will hopefully make it easier to see what has changed between all the releases we have seen so far. Below is a table that we put together for our readers, showing each iteration of the Sony RX100 cameras, along with their key specifications. Please note that we have marked the superior features in darker blue, while the key missing features are marked in light red. As expected, the latest generation Sony RX100 series cameras are obviously going to have the richest feature-set and specifications compared to their predecessors. With a superior Stacked CMOS sensor capable of producing excellent images that surpass all the previous generation RX100 cameras, faster Bionz X processor capable of handling up to 24 fps shooting speed, 315 phase-detection autofocus points, 4K video recording at up to 30 fps (and now with 4K HDR on the RX100 VI), excellent OLED EVF and very respectable slow motion video recording capability up to 960 fps, this is a point-and-shoot powerhouse. The latest RX 100 VI packs a 24-200mm equivalent lens, offering the best reach among the RX100 series cameras. Keep in mind, however, that this comes at the expense of slower maximum aperture – f/2.8-f/4.5 compared to f/1.8-f/2.8 seen on the previous III-V models. Sony says that the new OIS is supposed to be excellent though (compensating up to 4 stops), so perhaps the camera won’t suffer as much in low-light conditions. The newest Sony RX 100 VI is priced pretty highly compared to its predecessors, especially the first three models that can still be bought today from B&H and other retailers. Which begs the question – is the latest and greatest really worth spending so much more money on? I guess it depends. If you really need more reach, faster and more accurate autofocus, ability to shoot 4K / 4K HDR / slow motion video, the RX 100 VI might be worth the price premium. However, if you are just looking for a solid point-and-shoot camera, I would say the previous generation models are worth looking into. The RX100 and RX100 II are obviously great bargains, but for a reason – they are a bit longer on the wide end (28mm vs 24mm is a huge difference in field of view), their image quality is not as great as on the latest models, they lack built-in viewfinders and their LCD screens are not as versatile. So keep all this in mind when deciding what route to take. OMG!! One article after another and again!! Do you sleep at all??!!! Thank you for all of them!! Kidding of course! I do sleep, but I also love shooting and writing. Hard to balance the two. You DEFINITELY belong to the best of the best this is MAGICIANS group, who have been driving this World ahead through out the history of the human’s development!!! Very Admirable Indeed!!! …. … since I bought it for photos the whole slow-mo and 4k part doesn’t do a thing for me…. maybe next year they’ll have some real improvements. You clearly do not need it since you dont understand what you are talking about. When you say no higher iso…I mean seriously, how dumb is that statement???? The ISO range is irrelevant, is how clean each camera is at those and the V version is surely better than the M2. Much faster AF..not even close, the lens is very sharp across the frame wide open unlike the M2…the list goes on. I dont agree..I still have the first version and it is very sharp.. not as sharp as my prime lenses but good enough to take out and get a pretty decent shot. I found the version 5 good but not enough to pay out all that extra money. In the end it is a compact camera only. That’s a seriously insulting way to respond to someone. Dumb? I agree. There is no need to be insulting!! The RX100 m2 has a built in flash ! Bob, thanks for letting me know – I fixed the typo. Must have missed that from the list of specifications. Hi, good comparison write up. I’ve had the MkI, MkIII and MkII, in that sequence. The MkIII has another limitation, which is that you can’t take still shots while videoing. My understanding is all the other later versions can do this too (certainly the MkI and II can). I went from a MkI to a MkIII, then realised the limitation, hence I subsequently bought a MkII (as I was too upset at the limitation to buy a Mk IV, which came out just after I bought the Mk III). My first MkII just died and I managed to get another used one and am so far happy with continuing with the MkII as I wasn’t willing to trade the low light performance of the MkII for the MkVI (and the cost). I’ve given up lugging around my DSLR as it’s just too much stuff to carry around. People, don’t buy any of these camera. They handle like a bar of soap in your hand. Sony does not make cameras for photographers, it makes cameras for consumers. Pol, just wondering if you actually had a chance to shoot with any of the RX100-series cameras? never bought one cause i wouldn’t give even a cent to Sony. Tried RX100 II in the camera store and it was awful. I am a photographer and i have owned many compact cameras, which i use when i don’t want to carry the D4. The RX100 (i own the M2 and the M5) are the only compact cameras i like and which i will carry instead the DSLR. No Nikon or Canon compact comes close, and i have tried many models. I had a Canon Point and shot comparable to the rx100 series, S9 I think it was, but it was a complete piece of junk build quality wise. The lens stopped working and wouldn’t come out anymore. I was so pissed with it I took it out and set fire to it. I have a Sony rx100 II and it blew the doors of that Canon in every conceivable way. I have put it through the mill at heavy metal concerts in the pit, outdoors backpacking, and at the beach. Never had not one failure. Still going strong and the one I bought was a refurbished. You don’t have a clue. Most people have no idea the concert photos were taken with a point and shoot. I use it in manual mode. I’ve had some published. Sony makes high quality gear and that’s why I got rid of my Nikons and went Sony Mirrorless. Way more portable and built like tanks. Get a clue. He’s never handled one so shouldn’t be making comments about things he knows nothing about, even if he is 100% correct. I have owned one (the mIV) and it was the most uninspiring camera I’ve ever shot with. I replaced it with the Canon G5X which although a bit larger it is an universe apart in terms of handling and for me one of the most inspiring compact cameras to shoot with, now if they only made that zoom a manual zoom a la X30! I still prefer color from Canon/Fuji, Sony is a bit too neutral you need some work to warm it up (to my taste). Menus and buttons are sometimes a bit awkward though. I have a lot more concern about the resilience, they seems to not tolerate some weather conditions, few friends around me, not a large sample. Now, when it came to image quality, the RX was wonderful. The video is fantastic. Sadly the buck stopped there. A month into the RX I dropped it roughly 3 ft to a hard tile floor, and the camera was busted. Broken metal, no less. Cost me $220 to fix. About a year later it slips off my computer table to a hardwood floor. Rear monitor toast. I’ve owned a multitude of compacts from Fuji, Canon, Nikon, Toshiba, Panasonic, et al. I’ve dropped every one. More than once. Some at distances greater than what the RX dropped. None of them ever flinched, and all of them continued to work just fine. All of them cost far less than the RX100 III. I’ve dropped the RX twice, and twice it’s been toast. In all honestly, I cannot with a clear conscience recommend the RX100 series cameras to anyone, despite all the wonderful tech and image quality capabilities of this camera series. You can buy silicone, non-slip cases (skins) for these cameras (aliexpress). to say the least. Viewfinder alone is great when shooting in bright sunlight. longer reach is a Big Plus. I agree. I have wanted to buy one an RX100 for years but they do feel like a bar of soap and a bit tinny a well. Might be worth mentioning that version I does not have wi-fi built in while II, III, and IV do. Preston, I believe that’s in the chart? One advantage of the RX100 ii not mentioned is the fact that it accepts the Sony ECM-XYST1M external microphone for video recording. AFAIK none of the other models can be used with this accessory. Given the RX 100 series’ video prowess this is a significant add-on which further enhances the camera’s capabilities. I use this mic on occasion when I’m wanting better audio quality, and especially appreciate that it includes a wind sock which comes in handy on gusty days. Ted, thanks for sharing, I did not know! Also, the RX100 ii connects with the “Sony RMVPR1.CE7 Multi-Terminal Shutter Release” which is quite accomplished. I believe it is connected with the same port (“Multi Function…”) that accepts the microphone. This port is located “beneath” the flash hotshoe, meaning it is part of this hotshoe. I have the first version of the RX100. I bought it about a week before the 2nd version was announced, perfect timing as usual. The EVF and tilting LCD screens on the newer models would definitely be useful for some shots, but the cost to upgrade is too much for me. I doubt if the newer models really deliver significantly better image quality. BSI would give some improved sensitivity to the really small sensor cameras but not so much at this size, and the main benefit of the stacked sensor I think is in video features. One thing that bugs me about all such cameras is that the lenses only close focus at the shortest focal length, making it harder to take macro photos without getting a shadow or scaring off the subject when photographing insects. If you are shooting RAW the difference is 1/2 stop at the most. I actually prefer the more natural colors from the original non-bsi rx100. I also prefer having the faster aperture at 28mm for indoor shots, effectively negating any sensor advantage with the new models. As an owner of the first edition [mk1] I do not completely agree wrt the noise remark solely. One reason for me to NOT move to the newer camera’s is the focal length they changed as from mk3 to 70mm only vs 100mm mk1. Now with this mk6 the focal length is now 200mm, BUT now I have an aperture going down from 1.8 to 2.8. OK the latter might be compensated by the (much?) better electronics, but I am not yet convinced. And everybody seems to compare the new mk6 only with the mk5, none are having a good look through the years. IMHO the mk1 was (and still is) a tremendous machine! And in some parts (like focal length and aperture) better than it’s successors. The mk2-mk5 therfore never have convinced me to buy a new one. The mk6 does not fully convince me either, also because this camera has become significantly more expensive than the mk1 (which wasn’t cheap either!). PS wrt to the soap falling problem, I use the bottom part of the leather carrying case which always stays on the camera. Therefore never have had to bend over to pick up the camera/soap. Do you have any information regarding dust collecting on the sensors of these Sony’s? Or manufacturer related cleaning? It’s been such a big issue with me over the years, Fuji and Canon, that I have moved to mirrorless, which can be easily cleaned, but really don’t fit in a pocket. Fuji didn’t want to talk about cleaning my F31, and the Canon I sent in for cleaning under warranty came back as a refurbished unit, with even more dust than the one I sent in. These units seem to be too big an investment to lose them in a couple of years to dust motes. And I hate cloning out dust. By the way – I am very pleased with your gel sticks for sensor cleaning. I had used wet and dry swabs/brushes in the past but the gel stick is better. Glad to hear that you like the sensor gel stick! I would like to buy such a point and shoot with 1″ or micro four third sensor for my travels. => I just wonder if it’s better to buy one of these Sony, or Nikon or Fuji? Great chart Nasim! I have an A7, but on the fence for adding one of these vs an A6000 or A5100 to the stable. I bought the MKII last summer and it is a superb little camera. The quality vs size is excellent I take it everywhere with me. It has reignited my passion for photography. My dslr was sitting gathering dust, the funny thing is I use it more now also. Thanks Nasim for all the effort you put in reviewing all the gear. hi, i know this post is old but have spent the whole day trying to figure out which camera to buy……..i am down to trying to work out the optical zoom significance, the chart above does not mention this although i know for the RX100 it is 3X, having read about other cameras that are less than £100 but much higher optical zoom i am even more confused as X3 sounds not so good? i am not a photographer i just like to take pictures when out and about, holidays, family etc and i get a lot that are grainy as i use my Iphone only so wanted to invest in a good camera that can fit in my handbag, we will be using it for our USA trip from Vegas to San Fran to LA so you can imagine the sort of pics i will be taking, i am on the verge of buying the mark 2 at the moment as don’t want to spend much more than £300 and it looks like it will do the job but just need to know that the Zoom in line with the other features will give me a great picture and that i can switch from RAW (at night/lights) to JPEG as and when i want to? Thanks for the side by side breakdown and comparison. I purchased the original RX 100 back in 2012. I was in my 2nd semester of film production and wanted a camera of my own instead of having to wait for the shared cameras we could check out at school. I needed something that would allow me to do some of my assigned projects at a quality level on par with the 5D’s that were the main camera students checked out… but I really didn’t want anything that big. I stumbled onto a few reviews on the RX 100, saw sample images and video and I was sold. Four years later, it still stands up pretty good. I’ve noticed the image quality is better on some SD cards than others, it might be a fault in the cards or the camera is a bit finicky on what cards it likes. I even purchased an underwater housing for it because I wanted a better image than a GoPro. I think the only hang ups I have, are that in video mode, which I use the camera for 90% of the time, shutter speed is automatic and F stop is limited by the zoom. Also the American models of the RX 100 I and II are native at 30 fps but can also shoot 60 fps, which when edited at 30 fps will give you a noticeable slow motion… not as great as 120 or 1000 fps but decent. I have been looking at getting the II because, as someone mentioned in the comments earlier, you can use an external mic. And though the audio recording isn’t bad on the I, an external mic is that much better. Here are just some of the things I’ve done on my RX 100. This was a class project that I had little time to plan and shoot. No color correction done, straight footage. A stop motion film class project. A ton of macro photos in very low light. A friend of mine was asked to take stills for this band and invited me along to the show, I volunteered to take some video for her. It’s the camera you have with you, right? For the vast majority that’s a cell but for us smitten with photography either of the RX100xxx are amazing in the tech to size ratio you can have in your pocket. If nothing else all the HFR features are fun and invite exploration and creative ventures. I think the advancement in the 1 inch sensor is amazing in the DR and ISO performance–this comparing 1st gen and 5th. I just added the V this week and passed the III to the better-half. My everyday everywhere carry is a GX8+PL100-400 and the RX100v, both in a sling-bag. Every time I think about the overall focal range-24-800mm 35 equivalent I shudder! Nope not a Sony fanboy (though I did just receive a Minolta 400 APO for the forthcoming a99ii), I shoot Lumix and lots of EOS bodies but no matter how I look at it the RX100 series is the most in the least :) The only camera that ever came close was the Lumix GM-5. Nasim, thanks for the great work here and the wonderful chart delineating the differences between the gen’s. I am currently using RX100 mark III for underwater photography. I improved my shots on manual mode and decided to continue with RX100. I believe it is the time to have a backup camera for potential flood of camera. Should I buy another mark III or go for mark IV or V? Appreciate receiving advises from underwater photographers. Arif, I can’t help with your question as I am just on the way to decide which version of camera to buy, but I am interesting also in housing. Which one do you use for it, Recsea Aluminum or any other? You should buy another mark III becouse then you don’t have to buy another UW housing. I am using Mark I with Nauticam housing and I am very happy with the results! Slog2 is also present in mark iv, i believe. Great review by the way. The RX100(1) and the HX80 are about the same price now. Either would be mostly a travel camera for me. Big difference in sensor size, zoom and lens brightness. I tend to favor good low light performance. So am leaning toward the RX100. What do you recommend? I bought a Mark III shortly after launch for an international trip and love it. MKBHD has a good review video of the 3 and the 4. For me, the only killer feature over the 3. It’s my only pain point. For example, focus is difficult with moving targets like trying to take pictures of my dog or trying to get candid photos of friends/family while walking or dancing. at $1k, I definitely won’t be upgrading. I’d rather get an entry level DSLR for that. The M III remains the sweet spot I think for casual photography in a pocketable size. thank you very much for this comparison. I am in the market for an Rx100, competing maybe with a Fuji X70. I think that for the Rx100 series, the big jump happened with Mark III. The improvements that IV and V brought are mainly related to video, or, when related to stills are mostly incremental. I see a big jump in features in terms of phase-detect AF being added to V, but, as I haven’t used any of the cameras I am not sure how significant that is in real life. I guess what I’m trying to say is that the III is the sweet spot in the series, would welcome any more comments on that. Thanks so much for this article! Super helpful! Patrick, not everyone is a photographer, although they take pictures, so it is a shame that you appear to dismiss anyone who fails to reach your own values or high standard. And why do photographers, experienced or not, have to use Photoshop or Lightroom? I know a number of excellent photographers who have dropped these in favour of other programs, and I’m one, well at least I use an alternative – I wouldn’t claim to be an expert, experienced, yes, I started to learn my craft almost 6 decades ago. Great work is being produced which only needs a modicum of image adjustment if the photographer really knew what they wished to achieve at the point of capture, actually this was what died in the wool film photographers were all about. So please give a thought to those supposedly inferior souls that, though possibly less knowledgeable than you, may just enjoy the hobby more. I have been using my RX100M3 for over a year and use this as a portable substitute for my Nikon D300 DSLR. The M3 provides excellant quality and flexibility with some facilities not even available on the D300. I carry the RX100M3 on my person 24/7 and without a backpack nor backache. Also, no hard choices to select the best lenses for the shoot. I recommend the stick on grips, the filter holder addition with circular polarizer (a must), and I have just ordered a Sony Battery with Charger for Action Camera [ASIN: B00NM9J5LQ] which includes a tiny charging sleeve with USB connection. The advantages of the M3 over M4 and M5 are marginally weight but more significantly battery life., The continuous video times look good too. My DSLR comes out of the cupboard for closeups of wildlife. I have a model v and love it. Handle to keep with me at all times and beautiful photographs. Excuse my grammar “Handy” and “comment”. Drat. Nasim thanx, I had spent 2 hours last nite bouncing between the RX100 series making comparisons. Once again many thanx. I like the extended zoom on the 2 and I also like the f stop change on the 3. So much to consider. Well not really it is all fun and creative. Thank you. I agree. These serve no purpose but to distract everyone and disrespect the author — I wonder what goes through the minds of folks like this as they decide to add these comments. Regardless, great article and a number of very good/helpful comments as well to help decide between these great choices. I had an old RX100 since 2013 that was unfortunately dropped after years of great photos and videos. One thing I liked about it that I don’t think was mentioned was the ability to take photos while taking a video. The quality in this mode was not the best in the original RX100. Did it improve, or is it even still a feature in the other models? Also, can I get some feel for noticeable differences in processors, improved focus points, weight for carrying in your pocket all day, and battery life for a day trip. Trying to decide between the III, IV, and V. Thanks. This website almost through Me off.. The Mark 4 shoots S Log as well! Not only the mark 5…. Now that I know this I’ll try to get mark 4 instead of 3. How are the newer versions standing up? The rx100m1 I have. died after only 3 years and 3200 shutter activations. I loved the camera but the short life cycle has made me hesitate to buy another. I am a total novice and honestly I googled to read about RX100 series. Came across this article. Great suggestions and advice ! I bought the RX100 (I) and it was Made in Japan. May be I am a little paranoid over the Made in China vs Made in Japan. However its not a let down. The portability of not carrying a bulky DSLR and slipping this tiny masterpiece into your jacket and carrying everywhere is worthy for a novice like me. For somebody like me, its great to share the pics videos, but lack of Wi-Fi is a disadvantage. I was looking at RX100 V but its double the price. I think I would stick to what I have. Love the first version the best…its a good compact and going to the latest versions isnt necessary unless you need a viewfinder. Tried all of them and still stick with the first one. The extra money saved goes for a new prime lens for my dslr. Win win situation. This looks like it is a fantastic camera, and a worthy replacement for my RX100 III (Fast) + Panasonic ZS100 (long), but disappointed there is no GPS! Ken, the A5000 is nowhere near as pocketable as the RX100. It is an interchangeable lens camera, whereas the RX100 is a point-and-shoot. Two completely different cameras for different needs. I agree, the value is much better with an APS-C camera like the A5000, but for those who want a small do-it-all camera that can do things like 4K HDR recording (which the A5000 can’t), the RX100 is a great choice. Nasim, although I have no interest in these cameras, I have to say you’ve done a marvellous job in your table of comparison between the various models. In the digital world, 6 years is a long time for any camera range, and by keeping to the same model number and just giving them a I to V I suffix, Sony has done a lot to muddy the waters for anyone intending to buy one. I even found it interesting in itself just to go through the table methodically and apart from the improving sensor technology I did wonder why Sony made some of the other changes, especially the lens. But I suppose looking at it from today’s perspective, there is a lot of choice. Another improvement to the Mk VI version is that you no longer have to extend the EVF eyepiece optics toward the back of the camera before use. Just pop it up and start shooting. Daniel, yes, USB charging is available on RX100-series cameras. These are very interesting cameras and obviously very powerful. I own a Nikon 1 and the main complaint I have is the delay in releasing the shutter. It takes the camera significant time to lock focus and release the shutter, as opposed to my D7100 which is much, much faster. If I’m taking pictures of my dog, for example, he has already moved by the time the Nikon 1 finally gets around to releasing the shutter. How would to say the RX100 compares to a typical DSLR in locking focus and releasing the shutter? Thank you as always for your great reviews and other great articles, I always enjoy coming to this site. John, most mirrorless and point and shoot cameras are going to have the same problem with powering up before the camera is ready to take pictures. I think there’s a typo there in the chart. The Mk I can do 1080p video at up to 60 fps. I know this because I have one. Yes, it was a typo – thanks for letting me know. I took care of it. I noticed there is no threading on the lens of the RX100 V1. Is there after market hoods available? I am a proud owner of RX100 M3 because of its good performance in low light. In 2014, I took hundreds of beautiful northern lights pictures with this camera during my 5-day trip to Northern Norway. Many of these northern lights pictures were taken by hand-held shooting using AUTO mode. I will be visiting Northern Finland in October this year. I am wondering if I should buy the new M6 (with a slower sensor) for this trip. Nasim: I have enjoyed watching your website develop into one of, if not the best photography website out there. Keep up the excellent work. I have carried a Canon S95 in my pocket for a few years now when I didn’t want to lug my full frame Nikon around. I paid about $500.00 for it when it was new. It is a good pocket camera and I have been looking at the evolution of Sony’s RX100 as a replacement for the Canon. Does the RX100 have any macro capability? That is one feature I require in any camera I carry. I’m trying to decide if I want to spend $1000.00 on a camera that is going through such rapid upgrades and changes every year. ND-Filter needs to be highlighted. Thank you for the comparison! It’ll be nice to see the newly announced RX100Va in there as well, I hope it’ll be released in US too, not just Japan. Thanks for all the great info. Is there any difference in Macro capabilities between the models? As far as I know, between the V and the VI, the focusing distance is similar. This is on of the primary reasons why you would want a Sony RX100 vs the Lumix LS/Leica D-Lux. The focusing distance for those competitors is over a foot. 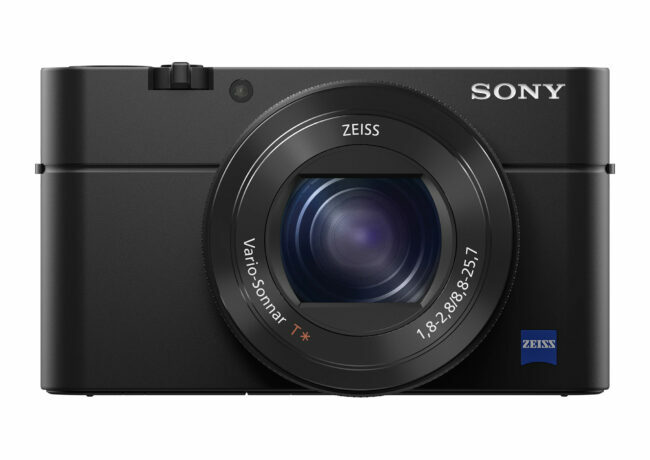 Could you update with the new RX100 VA? I’m interested to know if it has the new one movement pop-up EVF. If not… what’s the point, Sony? no, the VA has the same two steps pop up evf, like on the V.
ps: I shoot Nikon FF and Rx100 compact.. and can’t be more happy with these tools.. Excellent Article as I was looking for just this comparison. One thing I noticed wasn’t present is although the last 2 iterations have Phase Detect autofocus how many Contrast Detect points do they have? Do they all have Eye AF? Thank you for the chart. I had the first version of the RX 100 for five years. I am an older woman and although I love my Canon SLR back issues makes it impossible for me to carry around for any length of time. I took the Sony when I traveled -I love that it is small, light and not so obvious. I’m not a professional or and expert but I was never disappointed with the photos the camera and I took. This spring, I stumbled and fell and the camera was open at the time. It warped the barrel and Sony says it is not cost effective to fix. Now I find there are five models instead of the one. If what I want is what I had before but with a viewfinder (I missed having one) could you recommend a model to me? I don’t take videos and I don’t mind the extras step of downloading to a computer before I post on social media. Thanks! I still have a Mk1 which I bought in 2012. It’s great and I take it with me everywhere. My wife has the mk3 which I believe was the first RX100 with an electronic viewfinder. I think this is a superb little camera and my wife loves the EVF. This might be the one for you. I am a Biologist and I need to take pictures in low light forests of small flowers, insects and spiders. What is the best model for macro photography? How I long for a viewfinder but until Sony add remote off camera flash or a hot shoe I guess I will have to stick with my faithful M2 for the odd but important occasions I need flash, It might look silly with a hvl-f42am plus adapter sitting on top of this tiny camera but what great bounce flash results you can get with this thing, all the other versions would be a downgrade for me now having got used to working this way. I have owned the version 3 for 3 years. It is a wonderful indoor travel camera. The wide focal length is great for street photography as well as for those wide vista opportunities in the mountains and lakes regions. I’ve taken pictures in caves and in dinner theaters, in dark living rooms and under water on cloudy days. Yes, underwater. Recsea makes an underwater housing for this camera. They do not make underwater camera housings for just any camera. It has every setting my 7D ii has for manual and programmed shooting but the automatic modes are exceptional as well. As for durability, I am not going to test it by dropping mine on cobblestones. Your article is very impressive especially the “key specifications” chart at the top. I would like to see the RX100 VA added to this key specifications chart allowing me to compare the upgrade to the RX100 V. I hope you will update your chart soon. DSC-RX100 II has 1080p / 24fps. DSC-RX100 does not. Movie mode of 24 fps would be a good thing to show on the chart. Thanks for the write up! Are there any major differences between a RX100 III made in 2015 versus one in 2018? The comparison chart says no to 4K on the mark 5 – It does film in 4K . The first model (DSC-RX100) has the HDMI socket near the tripod mount, so it is impossible to use tripod and HDMI together (to connect a TV, for example, showing the photos taken automatically with self portrait mode). The DSC-RX100 mark 2 has the HDMI socket on the side (better). About the AC CHARGERS (Europe). The DSC-RX100 mark 2 comes with a small charger (0,5 A) that can only recharge the battery (you cannot shoot/play if it is connected). I’ve solved the problem using a third party charger (RawPower brand). The first model (DSC-RX100), instead, comes with a more powerful AC charger (you can use the camera with AC power). Hope it helps! Of all the RX 100 series which ones have flashes that tilt upwards like the RX 100 does? It has been very useful these past 7 years in low light scenarios. Maybe add that to the chart Nasim?